Hosted by Bill Anderson and Ray Price’s widow, Janie Price, we gathered a room full of Ray’s best friends to tell stories and sing the best of Ray’s hits. All on 5 DVD’s with over 6 hours of content for just 29.95 plus shipping and handling. Also, included in this package is the special Backstage DVD from the taping—extra stories and songs not included on any other volume. And the entire 5 DVD collection is yours for just 79.80. This giant of country music will never be forgotten, but can never be replaced. We only hope our Tribute to Ray Price can capture his legacy and warmth in a way only a family reunion can. 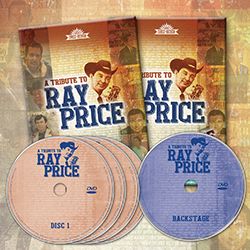 Country’s Family Reunion Tribute to Ray Price is available now. Order yours today.